Giger and Davidhizar's unique transcultural model of clear, easy-to-apply assessment and intervention strategies is the definitive source for use in the clinical setting! This authoritative resource will help you learn to identify the six key cultural phenomena used in caring for clients from different backgrounds (communication, space, social organization, time, environmental control, and biological variations), and help you apply these phenomena to a variety of individuals in different cultures. Unique! Giger & Davidhizar's Transcultural Assessment Model devotes a full chapter to each of the six aspects of cultural assessment (communication, space, social organization, time, environmental control, and biologic variations) to help you apply this model to any client of any culture. 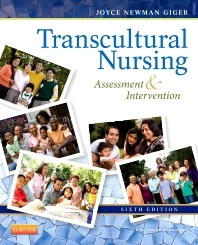 Expert author Joyce Newman Giger is a pioneer in the field of transcultural nursing. Case studies and critical thinking questions help you apply the assessment framework in practice. UNIQUE! Sample care plans demonstrate how to apply principles to specific client needs. UNIQUE! Discussion of the spiritual component provides a more holistic, integrated approach to culture and assessment. Clarification of biologic variations for select cultural groups raises awareness of potential risks/influences on client health.